It's been a while since I put together a shaker card! This one is for the current Lawn Fawnatics inspiration board challenge. 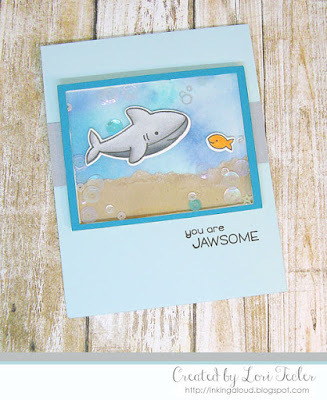 I made a shaker element with a watery scene featuring the shark (and little fishie) from Lawn Fawn's Duh-nuh stamp set. The background for the shaker panel was made with watered down distress oxides pressed on to a watercolor panel. While the panel dried, I stamped, colored, and cut out the images. I used foam tape to position them on the panel, then added a strip of torn kraft cardstock "sand" to the bottom" The shaker was framed with a teal rectangle that was backed with acetate. I filled it with a mix of blue, clear, and iridescent sequins in a variety of shapes, then assembled the shaker. It took some very narrow foam strips to adhere the frame to the panel so there'd be enough room for the sequins to move freely, so this ended up taking me a lot longer to assemble than I thought it would...I adhered the frame to a light blue card base over a strip of silver paper. The set's "you are jawsome" sentiment was stamped just beneath the shaker element to finish the card. With the fun shaker element, there isn't a need to add much more!